Join us for a conversation with scholar Mona El-Ghobashy on the Rabaa Massacre in Egypt, an event which occurred just over a year ago after the fall of President Morsi and claimed the lives of over 600, injuring more than 3,000. In the space of four short years, from 2011 to 2014, Egypt has gone through not one but several major political upheavals. In short order, a mass uprising toppled president-for-life Hosni Mubarak; the military hastily stepped in to steer the country; the first-ever free and fair parliamentary and presidential elections were held; and then a popular military coup toppled the elected president and put a military general in his place. 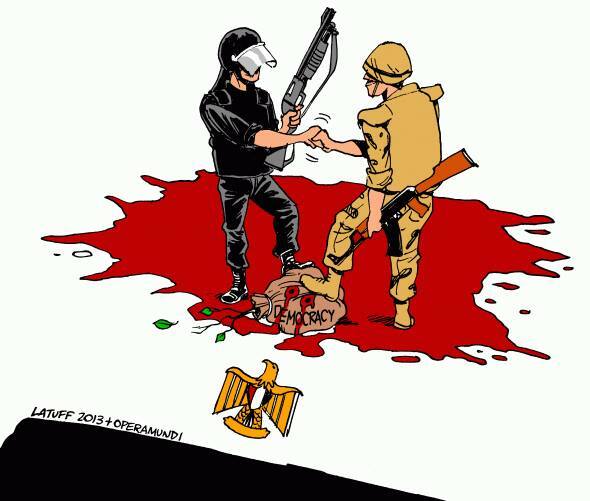 The pivotal event of the coup was the August 2013 mass killing of deposed Islamist president Mohamed Morsi’s supporters. This talk will discuss these political development and reflect on how we should think about them. Is Egypt experiencing a failed democratic transition, an aborted revolution, or something else? Mona El-Ghobashy is an independent scholar who writes on Egyptian politics. Her work has appeared in the International Journal of Middle East Studies, Middle East Report, Boston Review, and edited volumes. Supported by a grant from the Carnegie Corporation, she is writing a book on Egyptian citizens’ use of street protests and court petitions to reclaim their rights before and after the 2011 uprising. She was formerly an instructor in the political science department at Columbia University and an assistant professor of political science at Barnard College. This event is sponsored by Middle Eastern Studies, Political Studies, and the Human Rights Project.